SASKATOON — Prime Minister Justin Trudeau says Chrystia Freeland’s participation in a panel that lumped Donald Trump in with dictators like Bashar al-Assad was appropriate while she’s in the midst of trade talks with the United States. 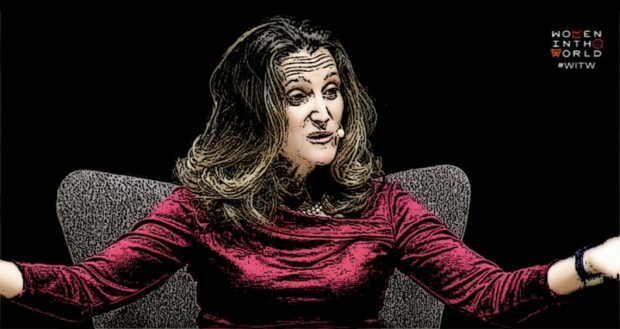 On Monday Freeland spoke on a panel titled Taking on the tyrant hosted by the Women in the World Canada summit. An opening montage for the panel said the world faces a “historic threat” from a “global tide of populism” and the “rise of autocrats.” The video then featured Trump along with the likes of Syria’s Bashir Assad, Russia’s Vladimir Putin and The Philippines’ Rodrigo Duterte. “Canadians expect their government and their representatives to stand up clearly for Canadian values and defend Canadians’ interests,” Trudeau said. Well, kiss that trade deal goodbye.